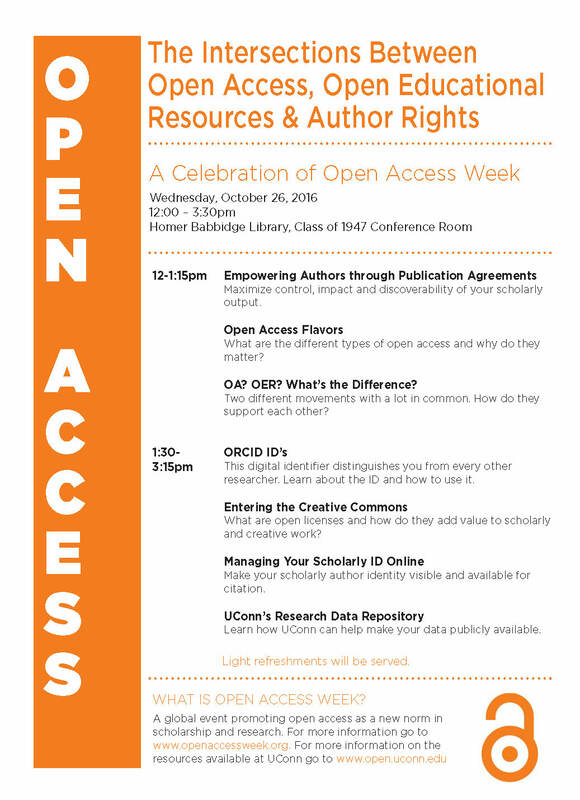 Please join us for a celebration of Open Access Week with a program that will bring together many pieces of Open Access and how you can make it work for you. Maximize control, impact and discoverability of your scholarly output. What are the diff erent types of open access and why do they matter? OA? OER? What’s the Difference? Two diff erent movements with a lot in common. How do they support each other? This digital identifi er distinguishes you from every other researcher. Learn about the ID and how to use it. What are open licenses and how do they add value to scholarly and creative work? Make your scholarly author identity visible and available for citation. Learn how UConn can help make your data publicly available. Open Access Week is a global event promoting open access as a new norm in scholarship and research. For more information go to www.openaccessweek.org. For more information on the resources available at UConn go to www.open.uconn.edu.